TSB Bank has escaped punishment from the Advertising Standards Authority (ASA) over a poster ad that promotes the brand's 200-year-old history, following its relaunch as a stand-alone bank last year. The poster ad, by Joint, stated: "Welcome to your new bank. It's 200 years old. Welcome back to local banking. TSB." One complainant challenged whether the ad was misleading, as the new TSB bank had been created by Lloyds Banking Group after demands from the European competition authorities. 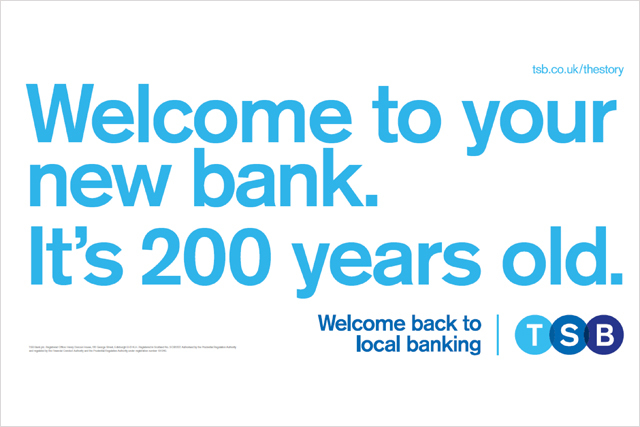 The bank argued that the campaign did not attempt to communicate that the bank had been trading under a TSB logo for 200 years, but rather it was a reference to its "heritage" as a 200-year-old company from the founding of the first trustee savings bank in 1810. It claimed that, although TSB had merged with Lloyds Bank in 1995, the TSB branding had remained part of the bank’s identity throughout the existence of Lloyds TSB. The ASA agreed that consumers would understand the ad to mean that TSB could trace a continuous trading history for a period of 200 years. On that basis, it concluded that the ad was not likely to mislead for the reason the complainant suggested. Last year, former Lloyds TSB marketer Nigel Gilbert joined TSB as brand, customer and communications director, reporting to chief executive Paul Pester.